Aerospace Legacy Foundation (ALF) is a community based non-profit organization (501c3) including aerospace retirees and the public at large. 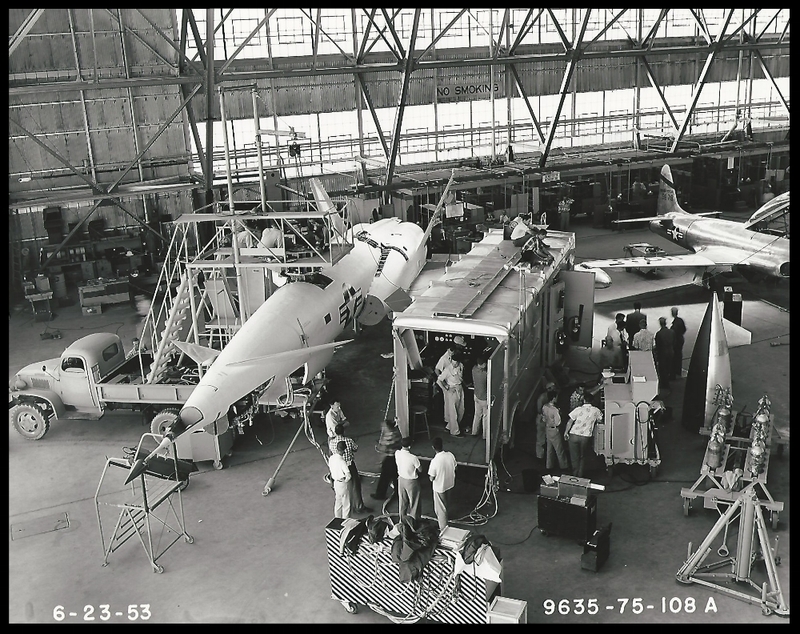 Preserving Southern California's Aerospace and Aviation History including Downey's aerospace legacy. 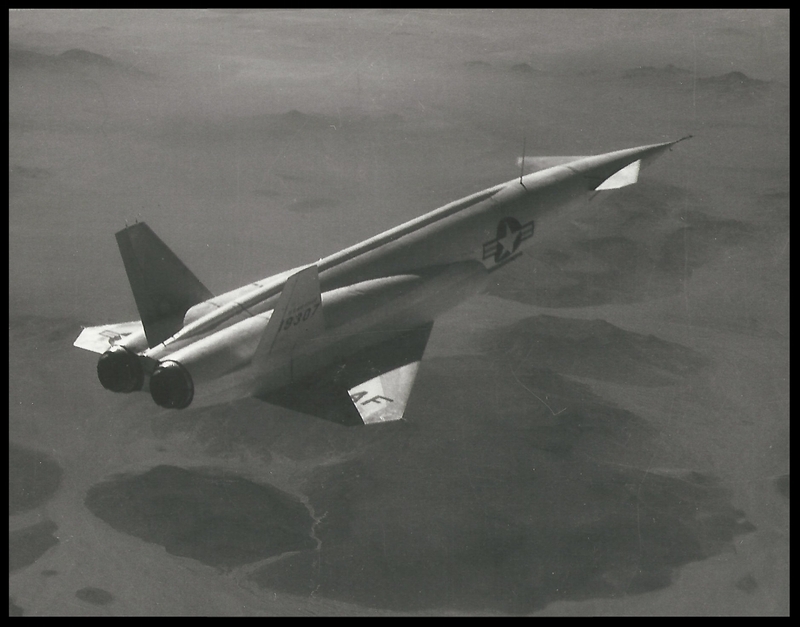 "The turbojet-powered X-10 tested flight characteristics and guidance, navigation and control systems for the planned SM-64 Navaho. The Navaho was intended to be a ramjet-powered, nuclear-armed cruise missile launched by rocket boosters. North American built 13 X-10s (10 of which were test flown), and the first X-10 flight occurred in October 1953. Although accidents destroyed several X-10s, the test program proved to be successful. One X-10 flew at Mach 2.05, a remarkable achievement for the time. In 1957, however, the Navaho program was cancelled as Intercontinental Ballistic Missile (ICBM) technology matured. "In May 1950 North American began design of an aerodynamic test vehicle for the planned intercontinental version of its Navaho Mach 3 cruise missile. This would be of the same dimensions and aerodynamic shape as the cruise stage of the production missile, but powered by existing turbojets, and capable of takeoff and landing from a runway, allowing reuse. Phase 1 of the revised development program would use this drone to test the aerodynamics, structural concepts, autopilot, and inertial navigation systems in an aluminum structure that could achieve speeds of up to Mach 2. 1. Although a test vehicle, the X-10 was designed for use as an intermediate-range supersonic cruise missile should the Air Force desire to put it into production. A forward fuel tank in the fuselage was unused in the test vehicle; and a warhead compartment was used for the PIX10 autopilot, telemetry system, cooling system, and nose landing gear. A weaponized version would have deleted the landing gear and systems, and been capable of carrying a 3150 kg nuclear warhead over a range of 2000 km. The Navaho, with its delta wings cropped at the Mach angle, variable inlets, and forward canards to control pitch moment in the transonic region, was an incredibly futuristic design when it was first conceived in 1947. Its aluminum body was designed to maintain its strength during sustained Mach 2 cruise would heat it to 240 deg C. Systems were cooled by running hydraulic fluid around them, which in turn passed through the main fuel tank, which acted as a large heat sink. Navaho X-10, 6-23-1953. Courtesy- Boeing Management Association. ALF Archive Image. Navaho X-10, 1953. Image Courtesy- Boeing Management Association. ALF Archive Image. "The most troublesome aspect of the X-10 were the 'supplemental' systems that were designed to make it recoverable and reusable. The drag chute just could not be made to work, and time and again the ground barrier systems failed. In retrospect, trying to make the vehicle reusable and recoverable may have been a big mistake. The 13 vehicles built made 30 flights, but many of those were wasted just working out the autoland system, and only one vehicle survived the test program. An expendable vehicle, or one with a jettisonable data capsule, could have achieved the test objectives, faster, using the same number of air vehicles. Perhaps for this reason, the Air Force decided to abandon recovery of many of the next-generation test Navahos. 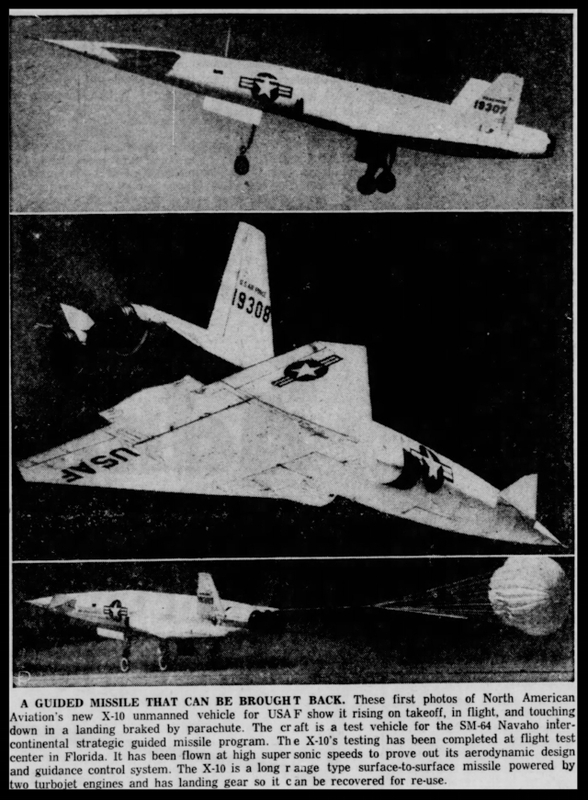 Following 15 flights at Edwards, X-10 flight test was moved to Cape Canaveral. A further 12 developmental flights were made here. The last X-10 at the Cape was used as a target drone for Bomarc surface-to-air missile tests until it was lost. The surviving X-10, the first built, is preserved at the USAF Museum in Dayton, Ohio. Navaho X-10 test firing. Image- Boeing Management Association. ALF Archive Image. X-10 Navaho missile at the ready. "Of all the X-10s built, only one survived the test program: serial 51-9307, the first X-10 to ever fly. Of the other four aircraft that flew at Edwards AFB, one blew up on takeoff, one was lost in flight and the remaining two were destroyed in landing accidents. As for the vehicles flown at Cape Canaveral, three were expended in planned dive-in flights against Grand Bahama Island, and two were lost in landing accidents. "The North American SM-64 Navaho was a supersonic intercontinental cruise missile project built by North American Aviation. The program ran from 1946 to 1958 when it was cancelled in favor of the Intercontinental Ballistic Missile.